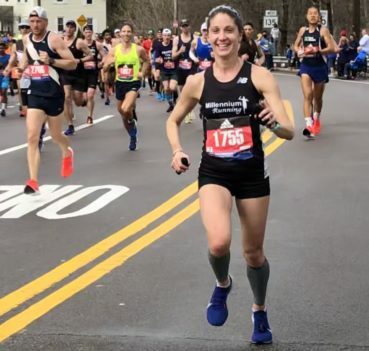 Boston, Massachusetts – Representing Millennium Running based out of Bedford, NH, Jennifer Mortimer completed the 123rd Boston Marathon as the top female finisher from the State of New Hampshire. Jennifer is the Director of Client Relations and Human Resources at Millennium Running and two-time All-American at Boston College, she completed the 26.2 mile run from Hopkinton to Boston at 6:57 per mile pace with an official time of 3 hours, 1 minute and 59 seconds to finish 2908th overall. This marks the fourth time in the last five years that a Millennium runner took a top NH spot at the Boston Marathon. Nick Aguila was the first male finisher from New Hampshire in 2017. In 2016 and 2015, Alex Leuchanka (Newmarket) was the first male finisher from NH. Denise Sandahl (Bow) was the first female NH finisher in 2015 and Olympic Trials marathoner Laura Hagley (Lebanon) was the first female NH finisher in 2016.